(1) Students will have to arrive on the Sunday 20 August and leave on the Saturday 02 September 2006. Participants should reach Helsinki for registration during the afternoon or early evening of Sunday, 20 August. Registration will take place at the SOKOS Hotel Presidentti. You should note that lunch on the day of arrival is not provided.. The School will end on the morning of Saturday, 02 September 2006 after breakfast. The Helsinki airport is Helsinki-Vantaa , 21km from SOKOS Hotel Presidentti. Buses services are available from the airport to downtown Helsinki: Finnair City Bus. The bus operates daily according to the same schedule: every 20 minutes from 05:45AM until 01:10AM (Timetable: http://www.finnair.com/filecontent/com/citybus_com.txt). The cost of 1 way ticket is 5,20euros and the travel time is 35 minutes. (Please note that taxis receipts will not be reimbursed by CSC). The bus stop near the SOKOS Hotel Presidentti will be the Helsinki Railway station. 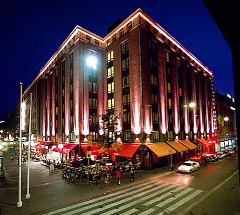 The Helsinki Railway station is situated at ~300 m from SOKOS Hotel Presidentti (5 minutes walk). Participants should ensure that they are adequately insured for health and accidents for the duration of the School and during their travel, to cover sickness, accidents and medical repatriation. This includes health problems and accidents occurring during any activity organized by CERN or by the local organizers such as but not limited to lectures and exercises, excursions and visits, sport and entertainment activities. CERN has no obligation in this regard and does not accept any responsibility for such coverage. Furthermore, CERN is not responsible for any loss of damage occurring to participant properties whatsoever during their travel to the school or during their stay at the school. 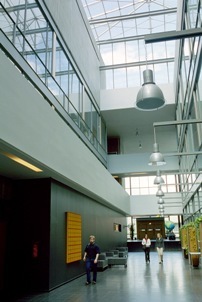 lunch and two daily coffee breaks at Kumpula Campus; accommodation and dinner at the SOKOS Hotel Presidentti, from dinner on Sunday, 20 August to breakfast on Saturday, 02 September 2006. Participants are warned that all meals will have a common menu. There will be no a-la-carte facility. It will not be possible to accommodate special dietary restrictions. Participants arriving before Sunday evening 20th of August or leaving after Saturday 2nd of September will be entirely on their own: the school will neither arrange for their accommodation nor will cover any cost associated to their extended stay. The sum of 1500 Euros does not include travel expenses from the participants' working place to the SOKOS Hotel Presidentti and back. Participants are on their own to organize their travel to and from the school location. The sum of 1500 euros should be paid prior to the school into the following account upon receipt of the letter of acceptance. Please note that administrative expenses such costs associated with visas are will not be reimbursed. Candidates should ensure that not only have they completed the web application form, but that a signed formal letter of reference (on formal headed paper from the applicant's institute/organization) from their professor or supervisor, reaches the School Administrator (Mrs Fabienne Baud-Lavigne) by 15th of May 2006 at the latest. In addition, a certification form (PDF version | Word version) must be filled in and signed by the applicant's professor or supervisor (and not by the applicant) and returned to Mrs. Fabienne Baud-Lavigne by 15th of May 2006. Applications received after 15th of May 2006 will not be considered. The selection of the participants will be made by the Advisory Committee and participants will be informed of the outcome of their application by the middle of June 2006.